Madison Heights, Mich. — Customers with complex, exacting mold requirements can now order a DME stainless steel mold base in any configuration. Ideal for applications such as clean rooms, corrosive plastics and high-humidity environments, mold bases made with DME #7 stainless steel will not rust or corrode, dramatically increasing the longevity of the mold. Ideally suited for food, medical and packaging applications, stainless steel mold bases are available in all 43 length and width combinations by DME in its “A” or “B” series mold base programs, with cavity plates up to 2.875” thick. 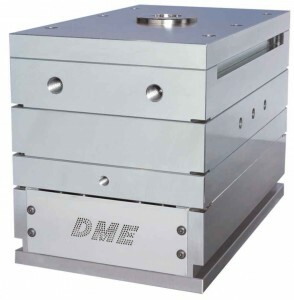 DME #7 stainless steel is a modified AISI 400 or equivalent series stainless steel for holder block applications. It is supplied pre-heat treated to 32-36 HRC (302-340 Bhn). Customers can browse DME’s online catalog and order components 24 hours a day by visiting www.dme.net.